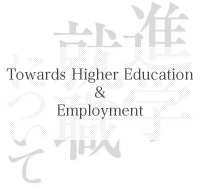 We provide support for the students who are seeking employment in Japan! The career advisor and the teacher will work together to support you through every stage leading to successful employment. Guidance on job-hunting in Japan will be provided. Guidance will be given to students in their search to select the company right for them. Information will be provided regarding job offers mainly in Japan. On-campus individual meeting session will be set up with prospective companies. Counseling will be provided regarding procedures for changing visa status. The Career Center supports you in many ways to find employment, from guidance to the actual application process. We provide consultations as needed to prepare you for job applications. 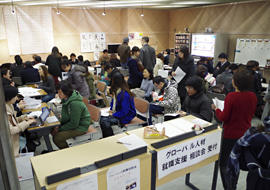 We also provide support to the graduates of Naganuma School who are seeking employment in Japan. If you wish to prepare for job-hunting in an effective way and to improve your Japanese at the same time, visit our Business Japanese Course page. If you wish to seek employment right away but need help in the job-hunting activities, we are offering a 1-month special program. Place of employment: Aritista tirare Co., Ltd. I was thinking of finding employment in Japan before coming to Naganuma, so I joined the Business Japanese Course when I finished the intermediate class. The most challenging part of the course was making business presentations on a variety of topics such as “Analysis on Hit Products” and “A Proposal on Business Improvements”. At first, I was avoiding eye contact with the audience because I had little confidence in my Japanese and my teacher cautioned me about this. The language and the content were both a challenge but, with practice, I gradually got better at making myself understood by the audience. What proved useful in the actual job hunting situations were practicing to write personal history and practicing job interviews. I was very pleased to hear when the Japanese interviewer told me my written personal history was better than that of the Japanese applicants. Training of self-analysis in Business Course also helped me to make a successful self-presentation for the real job interview. With the common objective of finding a job in Japan, I had a good relationship with my classmates talking about finding a job and encouraging each other during depressing times. There was a time that I felt it was impossible to find employment, but I told myself not to give up and stand up with confidence, and I finally made it. If you wish to find a job in Japan, I am sure that there is a chance, so make clear what you want to do in Japan and prepare for it step by step over time. I have a Japanese name because my father is Japanese and my mother is from Hong Kong. I was brought up in Hong Kong, but, since my childhood days, I felt troubled when people would ask me why I could not speak Japanese. Now I need Japanese because I wish to live and experience things in Japan like Japanese people. That is why I have been learning Japanese and have also experienced job hunting. I have been in a family environment speaking Cantonese, Japanese and English in a mixed way. I speak Japanese without giving it much thought and as result tend to make mistakes in grammar. It was difficult to use Japanese for me because I did not know Japanese manners and the correct usage of Japanese. I needed to learn idiomatic phrases and proverbs, as well as appropriate expressions in everyday conversation and Japanese cultural matters. The usage of honorifics and writing of emails, etc. that I learned in The Business Japanese Course have been very useful. Also it was good that I was able to learn basic business manners such as the Japanese way of exchanging greetings and in-company manners such as “Ho-ren-so” which foreigners do not know. Above all, there is a lot of job-hunting related information that we can access from the Course. In the future, I would like to be able to work in a position in which I can handle overseas matters while being based in Japan. I studied Business Japanese at the Naganuma School from Fall 2010 to Spring 2011 for 10 months. I thought everyday conversations wouldn't be a problem at all anymore, but when it comes to Business Japanese I realized that it's a totally different story and it was like I had to start lots of things all over again. The polite expressions and sometimes beating around the bush ways of saying things come in pretty handy everyday at work now when I have to deal with my Japanese co-workers or clients. I learned basically everything at Naganuma School from how to talk to my supervisor and seniors to how to talk on the phone and how to write business mails. The feedback I got during the mock job interview was really useful and I could put it to practice immediately during my job hunting. Furthermore, as I have to report to my supervisor, ask her for advice and contact her when I'm out meeting clients, it was really great that I had the opportunity to practice all that at Naganuma. I think the strengths of the Business Japanese class at Naganuma is that on the one hand you practice situations that really occur at work and on the other hand you can brush up your "regular" Japanese during the J-Module hours. The class is well structured and well balanced and as the teachers use different methods it's always fun. I'm really thankful for all the great support I received at Naganuma.